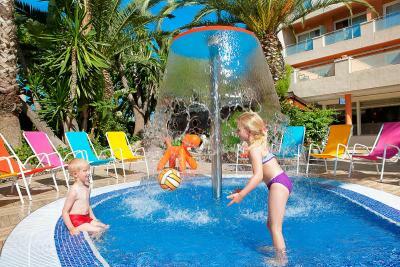 Lock in a great price for H10 Vintage Salou – rated 8.5 by recent guests! 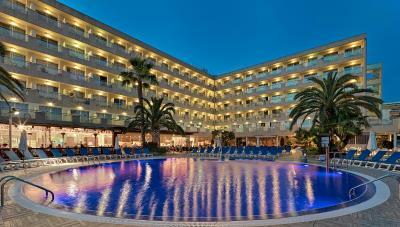 Fabulous hotel, our favourite in Salou so far, will definitely stay here again! 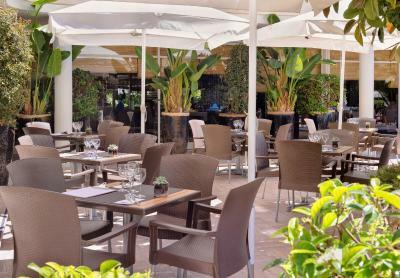 The quality of the food in the restaurant was particularly good and the waiting staff there were attentive and polite. 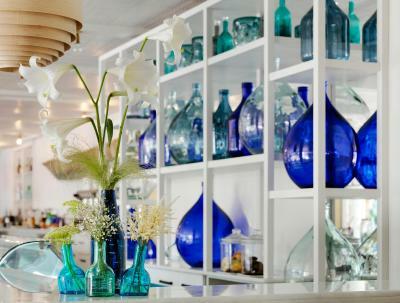 The general décor of the hotel was bright and modern and always kept clean and tidy. Bed was very comfortable, shower was good, scrambled eggs were excellent! Good as well by offering the use of the safe in the room for free. Waiters and Waitresses excellent particularly Pilar. 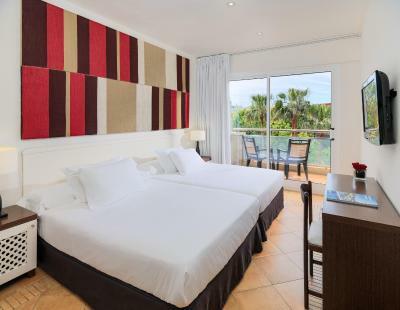 Location perfect for beach, local shopping, cheap buses up and down the coast and Portaventura. 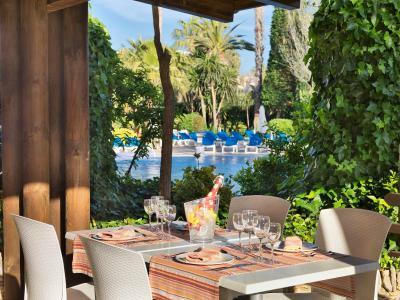 This is one of our favourite hotels in Salou, nice comfortable rooms, good choice of food, two pools one rooftop, highly recommend! Water and marshmallows on arrival and in reception most of the day. Internet use and printing. Entertainment in evening good to watch from the balcony if not going out and chilling. Great shower walk in size. Plenty of cupboard and drawer space. Huge bed very comfortable. 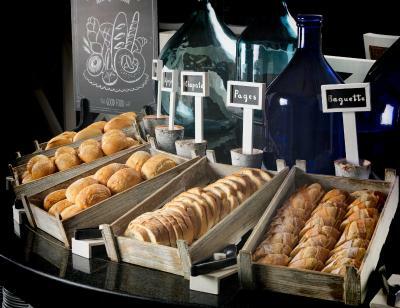 Excellent breakfast and lunch/dinner buffet style. Quiet very clean both the room and communal area. 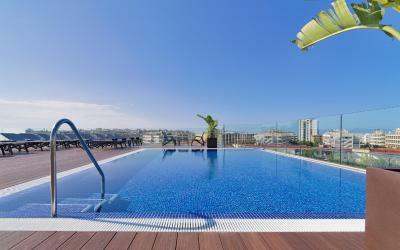 And pool area outside and plunge pool upstairs amazing great it's adults only. 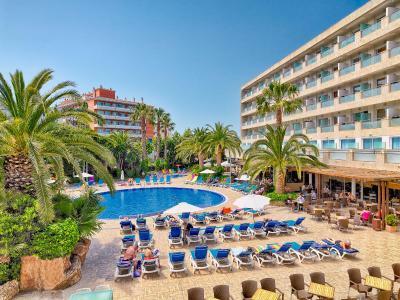 H10 Vintage Salou This rating is a reflection of how the property compares to the industry standard when it comes to price, facilities and services available. It's based on a self-evaluation by the property. Use this rating to help choose your stay! 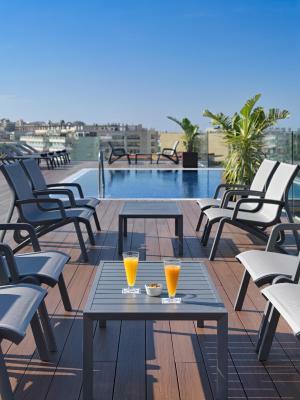 Located 1,950 feet from Salou’s Llevant Beach, H10 Vintage Salou offers an outdoor pool and an Adults-Only rooftop terrace with a plunge pool and sun loungers. 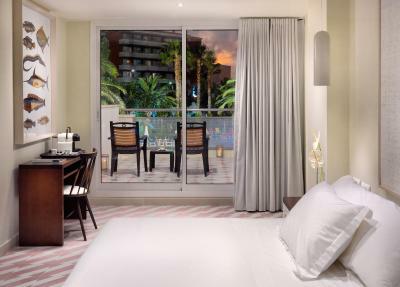 Each stylish air-conditioned room includes a balcony and flat-screen satellite TV. 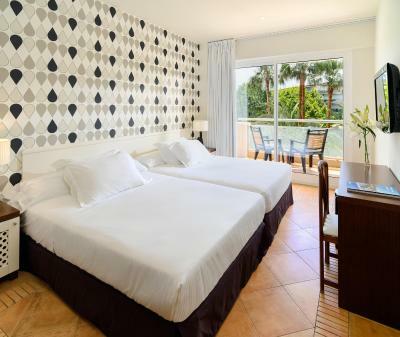 Formerly known as the Europa Park hotel, the H10 Vintage Salou offers rooms with simple, modern décor and colorful touches. Bathrooms come with toiletries and a hairdryer. Mini-bars and safes are available to rent. 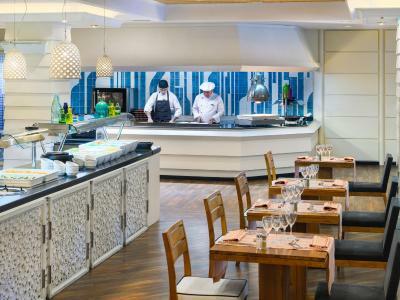 The Les Vinyes restaurant offers buffet meals with show cooking. 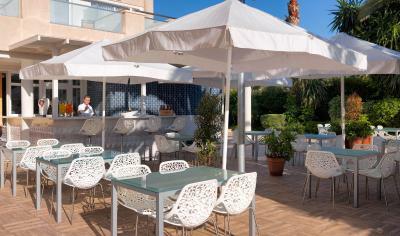 There is also a cocktail bar, a café-bar with a poolside terrace and a free Wi-Fi Zone. The hotel offers evening entertainment, including live music. 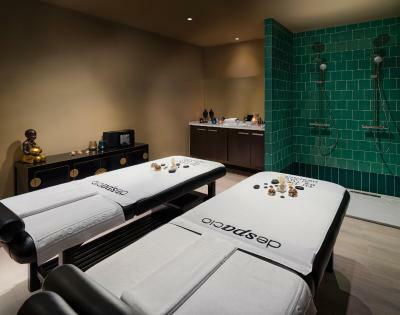 The Despacio Beauty Center offers a gym and massage services. 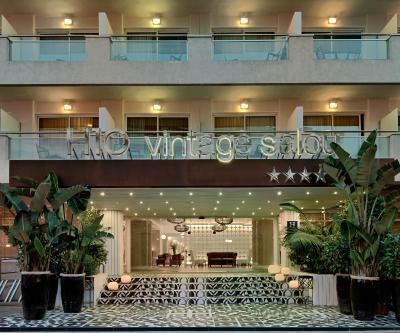 The hotel H10 Vintage Salou is located in central Salou, surrounded by shops, restaurants and lively bars. 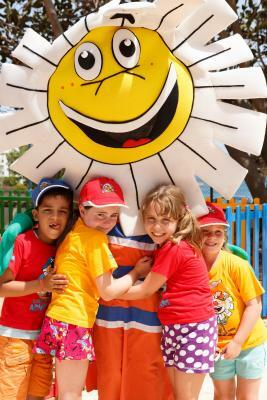 PortAventura Theme Park is 0.9 mi away and Reus Airport is within a 15-minute drive. 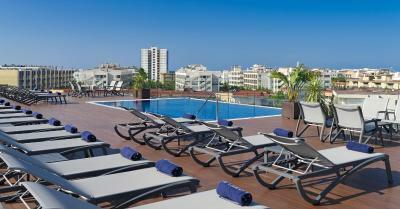 When would you like to stay at H10 Vintage Salou? 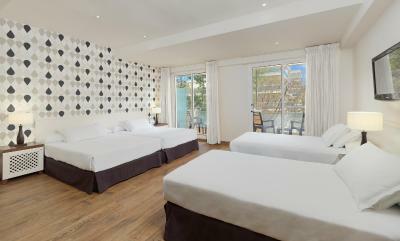 This air-conditioned room offers a private balcony, a free safe and a flat-screen TV with international channels. A hairdryer is provided in the bathroom, and mini fridges are available. This room will be refurbished in 2017. 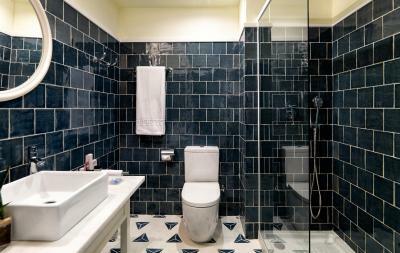 This air-conditioned room comes with a safe, a flat-screen, and a private bathroom with a hairdryer. A mini fridge are available. 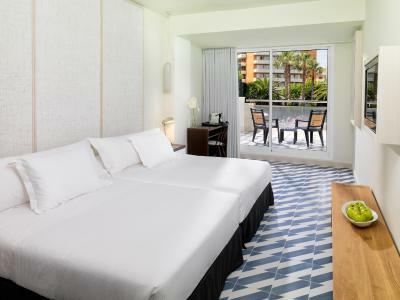 Offering pool views, this air-conditioned room features a flat-screen TV with international channels, a safe and a private balcony. The private bathroom includes a hairdryer. 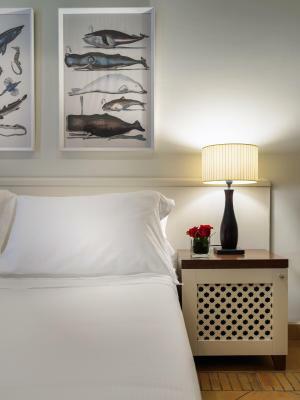 There is also a mini fridge and a Nespresso coffee machine with complimentary capsules. 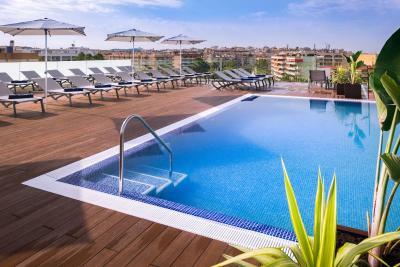 This air-conditioned room offers a private balcony, a free safe and a flat-screen TV with international channels. 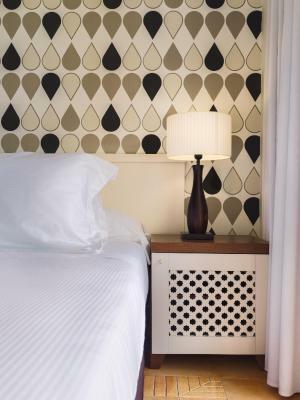 A hairdryer is provided in the bathroom, and mini fridges are available. 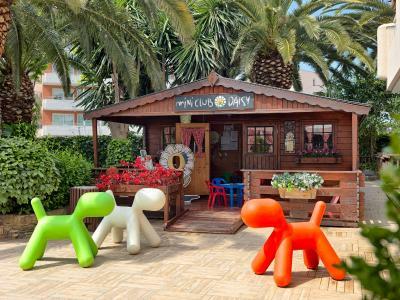 It sleeps up to 2 adults and 2 children up to 10 years old. Please note that the room has the same dimensions as the double room. Additional guests are not permitted. 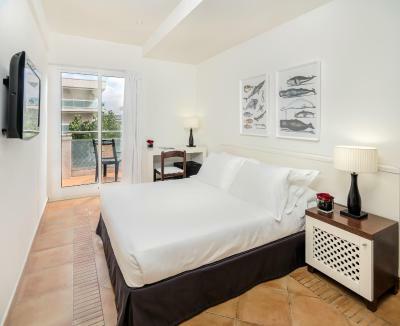 Refurbished in 2017, this air-conditioned room features an LCD TV, a safe and a private balcony with pool views. The private bathroom includes a hairdryer. A mini fridge is available. 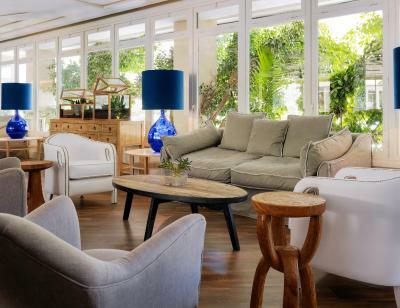 This family room features a mini-bar, air conditioning and satellite TV with international channels, a safe and a private balcony. The private bathroom includes a hairdryer. 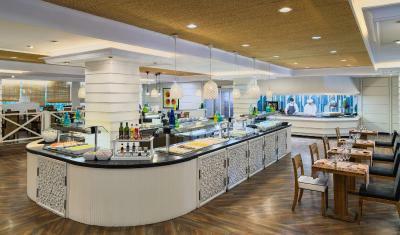 There is also a mini fridge and a Nespresso coffee machine with complementary capsules. Room with pool view. Maximum occupancy: 4 people (2 Adults+ 2 children). Please note that guests over 11 years old are considered adults. 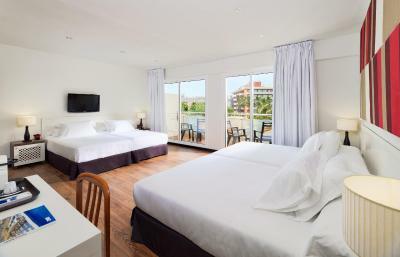 This air-conditioned twin-double room features a balcony with swimming pool views, flat-screen TV, a safe and a private bathroom with a hairdryer. A mini-bar is available. 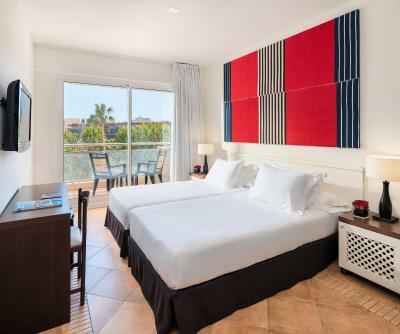 This air-conditioned twin/double room features a balcony with swimming pool views, flat-screen TV with international channels, a safe and a private bathroom with a hairdryer. 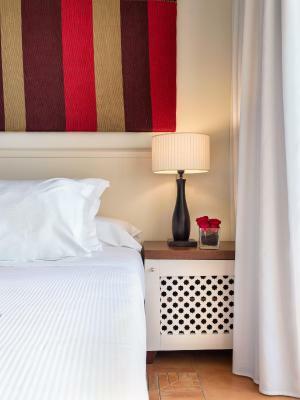 A mini-bar and a Nespresso coffee machine with free capsules are available. This room is equipped with 2 beds of 0.5 in and 2 beds of 0.4 in. 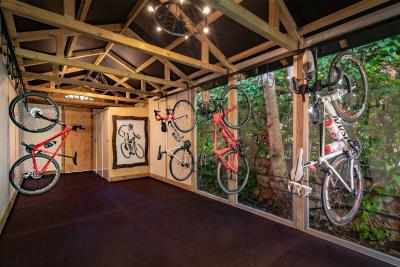 It can accommodate 3 adults and 1 child up to 10 years of age. It comes with a bathroom with a shower and a hairdryer. Air conditioning and a 32" LCD TV with international channels. 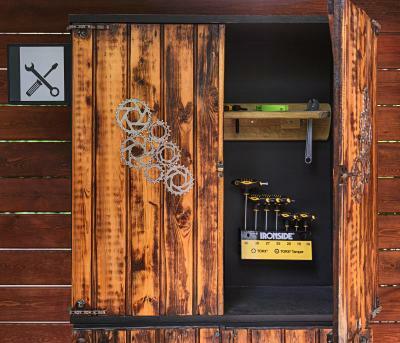 It includes an empty mini fridge, a Nespresso coffee machine and a safety deposit box. This room is equipped with 2 beds of 0.5 in and 2 beds of 0.4 in. 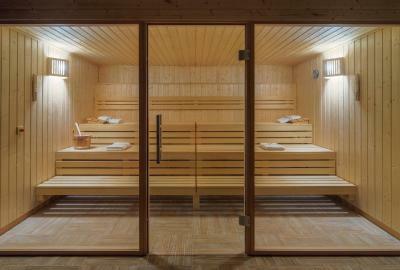 It can accommodate 3 adults and 1 child up to 10 years of age. 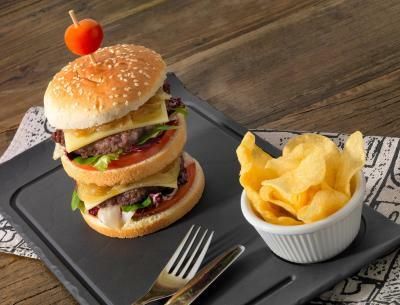 House Rules H10 Vintage Salou takes special requests – add in the next step! H10 Vintage Salou accepts these cards and reserves the right to temporarily hold an amount prior to arrival. Please note mini-bars are available for rent and subject to availability. Reception staff 's attentiveness a bit hit and miss. Hotel entertainment mainly set up for coach parties of 70/80year olds. Chose the wrong week we think. View from balcony very poor as right on the end next to road. Nothing at all. Couldn't fault this gem of a hotel. But more availability of spa staff needed nobody could offer massage over entire weekend. Not full service spa. It would be better if the bathroom had a clasic door, a wood door not a glass paravan, The only thing that was not ok.
Great Hotel, Great Restaurant and great staff. We had to pay city tax, even though our booking.com confirmation showed that it was included and we'd already paid for it. The receptionist said people always pay it at the hotel. Then gave us a story about the difference in the fee and what we'd already paid explains it, however, I suspect that difference was because of varying exchange rates. The floor especially, and the room in general, wasn't very clean as you'd expect. Table service sat outside was varied - the guy who served us most never smiled, didn't make an effort to explain anything to us, even though we made an effort in Spanish. Entertainment was varied. Some ok, and what you'd expect but Saturday night dancing girls was especially bad. Some bits of it were ok, and quite skillful, but mostly uninteresting and outdated. 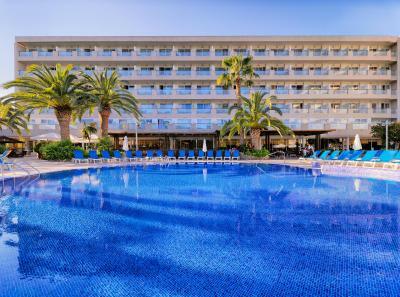 It's in Salou! We knew this of course, and were just using it for the theme parks really, but we had hoped Salou would be better than the reputation from the 80's, so we were disappointed, but of course accept that it's exactly what some British people want. Staff in general we're very polite and helpful, especially during breakfast and dinner. Nice pools. 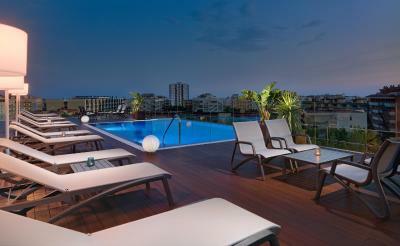 Nice to have the adult only rooftop pool. Location for beach, theme parks and buses good, but not so for train station.